There are a lot of shops that sell the cutest items for your baby but as you might know I am all for DIY’ing. It’s fun to create something yourself and it’s usually less expensive than buying something from a store. So when I saw this gold cardholder at a store I knew I wanted to make something for the baby from it. Sadly the store where I bought it doesn’t sell this item anymore, I found a similar product for you via Jut & Juul, click link HERE. The fun thing about items like these is that you can easily give it a personal twist. I used some small animals to hang, but also some personal cards that fit the color scheme of her room. 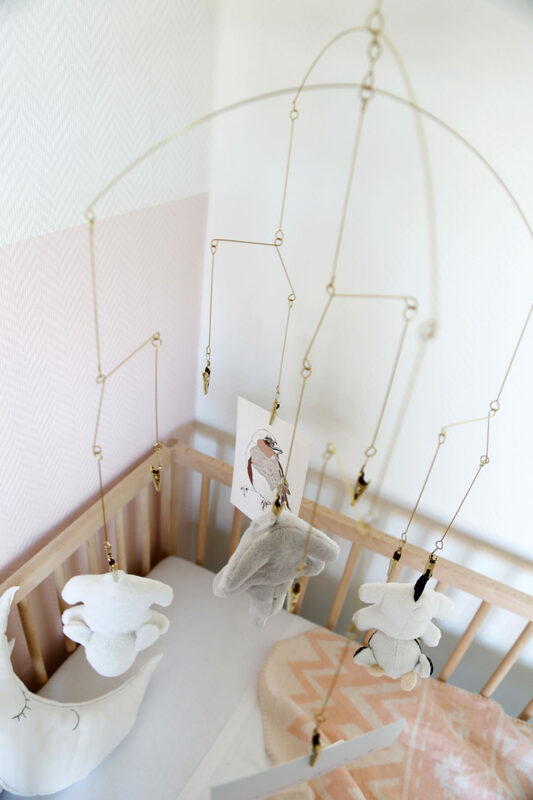 You can hang anything you like on there, your baby will love looking at it.